What should I expect from my initial instrument inspection? During the repair procedure we will lubricate fine tuners, nut slots, bridge slots, pegs, and endpin screw with appropriate lubricants. When should I have my instrument serviced? Your instrument should be checked at least twice per year. Once in Fall and once in Spring. These are the times when your instrument is experiencing changing humidity levels and may need certain adjustments for proper play condition. What is the proper humidity level for stringed instruments? The proper humidity level for stringed instruments is 45 to 55%. We can help you with items to regulate humidity. Why are the edges of my instrument coming apart? In the winter, when the air is very dry, instruments made of wood such as violin, viola, cello and string bass actually shrink a bit. Sometimes this movement causes the seams to separate. This is fairly common and can be corrected by your repair tech. Do not attempt this repair with ordinary household glues. Your repair person will have the correct glue for the repair. Wipe your instrument with a clean, soft cloth after each playing. A good quality violin polish can be used with a soft cloth to help keep grease and rosin dust from marring the finish. 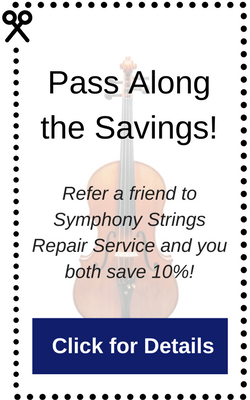 With regular student usage, strings should be changed once each year.